Amy’s mother, Kathy, and I met after we both finished breast cancer treatment at the same cancer facility, and I liked her right away. Kathy Gutierrez is a smart, determined woman who was raising two daughters, and I knew her daughters would be just like her, and they are. 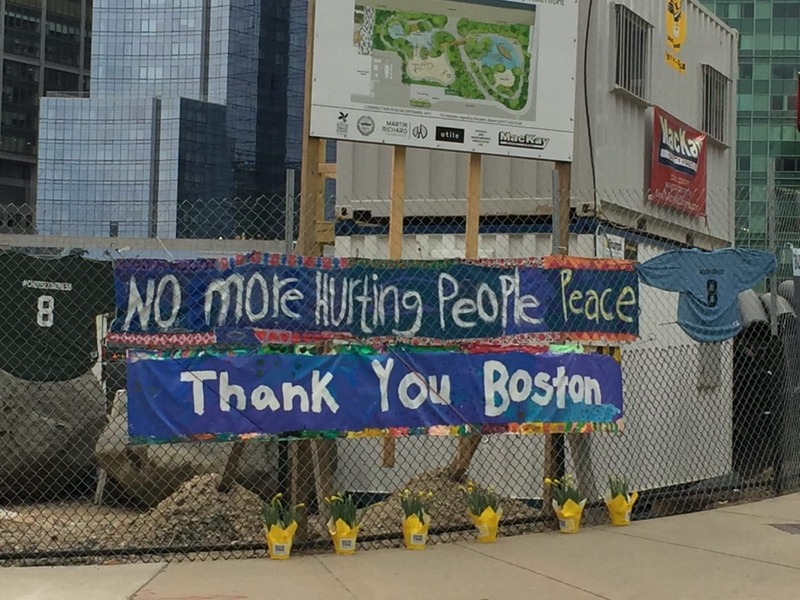 On April 15, 2013, Amy and her boyfriend, Jordan, now her fiancé, were at the Boston Marathon just a block from the finish line. While Amy and Jordan felt the tremendous power of the blast, they were unhurt, but that day changed Amy’s life forever. Always a compassionate young woman, Amy has responded to the senseless bombing with the heart of a warrior. Not a day goes by Amy doesn’t think about what happened, and she continues to carry the terrible fear she experienced that day. Instead of trying to blur the images of that unthinkable day, this coming April 15th, Amy will be running in the Boston Marathon and will be part of Team MR8, the official running team of the Martin Richard Foundation. Martin Richard was one of the three people killed in the 2013 bombing, and Team MR8 is named for Martin’s initials and his sports number. The Martin Richard Foundation seeks to provide opportunities for young people to learn, grow and lead through volunteerism and community engagement. The Foundation want to influence a generation to live out their values of sportsmanship, inclusion, kindness and peace by embracing the diversity around them. One of the ways the Foundation is doing this is by collaborating with the City of Boston to build Martin’s Park, a universally accessible park and playground adjacent to the Boston Children’s Museum. Amy Gutierrez isn’t just running as a member of the MR8 team. She’s committed to raising $7,500 for the Foundation. To help her meet her goal Amy has started a CrowdRise fundraising page for the Foundation. There you can learn more about the Foundation and you can make a tax deductible donation. I hope you find it in your heart to honor the values of kindness and peace by clicking on Amy’s link and contributing to the Martin Richard Foundation. You attract the most vibrant women to yourself, Brenda! How brave of her to run through her fear, and how brilliant to find a way to help others!